Starting a home yoga practice might seem like a challenge or some elusive fancy idea that you only see from folks on Instagram. I know I felt that way too. Thankfully, starting a home yoga practice is easier than I imagined and less intimidating than going to yoga classes. Because, going to your first yoga class can be pretty intimidating, at least for me it was. There are all these new people. All the new words that aren't (at least not always) in English. The movements you've never done before. It can be a lot, and it can be really overwhelming when you think about it. 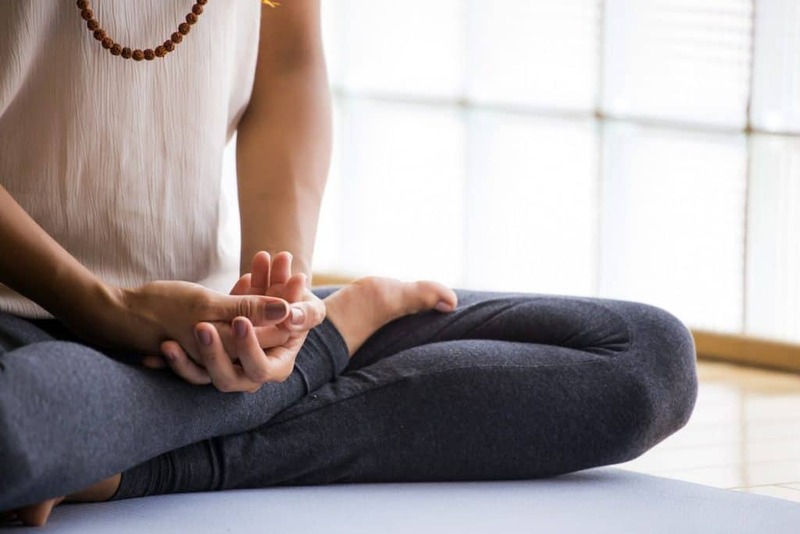 But, did you know that you can start a home yoga practice and never have to feel that awkwardness you might feel from going to a yoga studio? Of course, I would always suggest going to a yoga class a few times or at least getting private lessons from a teacher. This helps you learn the postures without second-guessing yourself. Having an instructor help you get into poses is really an awesome thing, but it's not completely necessary and many many people practice from home without ever stepping foot in a studio. 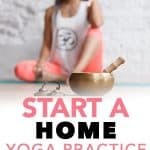 Why Would You Want To Start A Home Yoga Practice? Starting a yoga practice from home isn't hard, but it takes a lot of dedication. It's easy to sit around and make excuses for why you may or may not be able to or want to practice. You also either have to come up with your own sequences or find someplace that posts videos of sequences. Check out this post here where I list some yoga YouTube channels where you can follow along with some yoga sequences. Once you get into a rhythm with your practice it becomes a lot easier to maintain. You'll start to crave that time on the mat. Mats can really make a big difference in your practice. When you're hands and feet get sweaty from your workout things can get really slippery on the mat. My favorite mats are from Manduka and Liforme mats. I have one of each and I love them both. They're non-stick so they prevent sliding once your hands get a little sweaty and provide excellent grip. These two yoga sequences contain the basics of yoga postures and are a great starting point if you're new to yoga. Doing 5 rounds of both Sun Salutation A and Sun Salutation B is a great way to build strength and flexibility. Once you build up strength with these sequences it's easy to branch off and add in more standing poses, forward bending poses, seated poses, and inversions. But, the main thing is to not overwhelm yourself in the beginning. The more underwhelmed you are the better. It makes it easier to get started with your yoga practice and it also makes it easier to remember the sequence. As I said, if you're doing the same sequence day in and day out, it makes it easier to get on your mat daily. Make a conscious decision to at least do Sun Salutation every single day. Doing 5 rounds doesn't take long to complete, but it's better than nothing and will get you making an effort daily. Getting on your mat is half the battle, and getting through your sequence is the other half. Ahhhh savasana. This pose is possibly one of the most important of all. It allows our body and mind to rest, and also allows us to just be present in the moment. For that reason, it's one of the hardest poses for us to stay in and stay present. Check out this post here to see why it's important and what you can do to set yourself up for success. 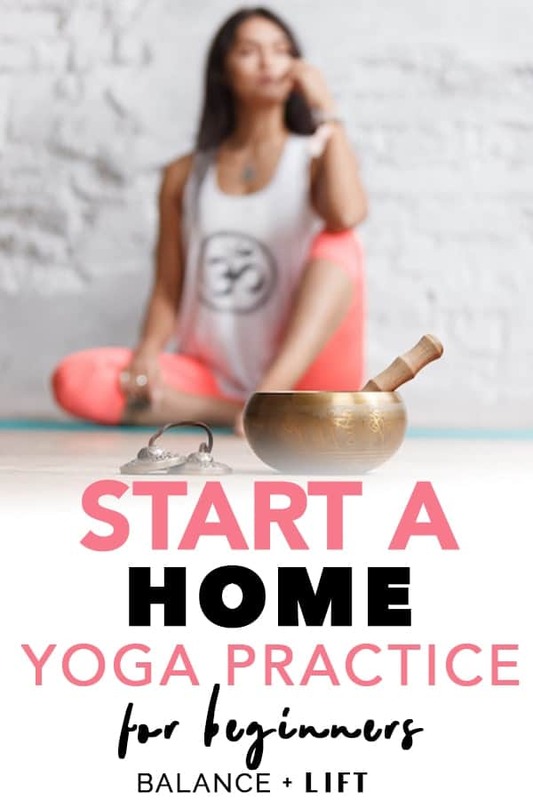 There are many places you can look for how to start a home yoga practice. Also, YouTube has a LOT of different yoga sequences you can follow along with. You can find anywhere from 5-minute sequences to hour-long sequences. Yoga really is an amazing practice. It's a great way to either start or end your day. Or both really. Thousands of people have experienced the benefits of yoga. All it takes is a little bit of time out of your day to see big rewards. It doesn't take a lot of time doing either. You don't need to practice yoga for 2 hours every day to reap the benefits. Even just 5-10 minutes a day will allow you to see the benefits of incorporating a yoga practice into your daily life. You also don't need fancy yoga clothes, tons of props (unless you want them), a huge perfect place to practice or anything really. Those things are nice to have, but it's not a “make it or break it” thing. In fact, most yogis practiced on yoga blankets if you can believe that. I'm thankful that yoga mats were created. I've tried practicing on a yoga blanket before and it's a bit rough (for me). It takes a lot more balance and strength than I originally anticipated, but it can be done. Again, these things aren't necessary (though a yoga mat does seriously help). It's not complicated or anything like that. I might seem overwhelming, but you can do it. Check out this post to find some helpful Yoga YouTube Channels that might inspire you to keep getting on your mat.